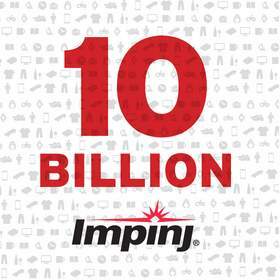 SAN DIEGO, CA--(Marketwired - Apr 15, 2015) - Item Intelligence™ platform provider Impinj, Inc. today announced it has sold 10 billion Monza chips -- connecting billions of items to the Internet -- and strengthened the Impinj platform with new products. "Impinj's 10 billionth chip is one more sign that RFID has hit mainstream adoption in retail, and that Impinj is a key player in that growth," said Bill McBeath, Chief Research Officer of Chainlink Research. "There are billions of apparel items per year currently being tagged, an indicator of how mature and widely accepted the technology has become. And there is still plenty of potential for growth for RFID in retail -- we estimate only about 5-10% of economically taggable apparel items are currently being tagged." "Selling our 10 billionth chip is a fantastic milestone that speaks to the value RAIN RFID is bringing to businesses and consumers around the world, connecting everyday items and thereby enabling the true Internet of Things," said Dr. Chris Diorio, CEO and Founder of Impinj. "I'm so proud of our employees and partners who made this milestone possible. Ten billion chips speaks to a technology maturity that allows us to focus on our platform and how it will make RAIN RFID part of our everyday lives." Impinj extends its platform with new products, including ItemSense software, Monza R6-P and S6-C chips, and the Indy RS2000 reader system-in-package (SiP). ItemSense software is a new and core platform component, that transforms raw RAIN RFID data into real-time, business-relevant Item Intelligence. Impinj ItemSense software, in beta, delivers Item Intelligence -- information about the identity and location of items, enriching third-party business applications in retail, healthcare and other markets. ItemSense makes RAIN RFID easy to integrate, shortening time-to-value for solution deployments. ItemSense uses modern web-services architectures for ease-of-use, scalability and flexibility. With ItemSense and the Impinj platform, partners can easily build business solutions based on RAIN RFID. Impinj is working closely with enterprise software providers that are integrating Item Intelligence into existing applications or developing new applications that Item Intelligence makes possible. "The Item Intelligence we get from ItemSense adds an exciting dimension to our retail analytics capabilities," said George Shaw, Vice President of Research and Development for RetailNext. "Providing store operators the type of intelligence about items that previously only eCommerce sites could deliver will be a major equalizer in retail." ItemSense is enterprise-grade software that centralizes and automates RAIN RFID infrastructure configuration, management and health monitoring. At general availability, ItemSense will support the Impinj xArray®, xPortal™ and Speedway® Revolution; in the future, it will support other third party devices as well. ItemSense provides APIs that enable multiple applications from one RAIN RFID platform, enabling inventory management, asset tracking, Real-Time Location Systems (RTLS), and myriad other use cases. ItemSense general availability is Q3 2015. For more information about ItemSense, visit www.impinj.com/products/software/itemsense. The Indy RS2000 reader SiP is a full-power embedded reader that enables quick and easy system development with low risk and fast time-to-market. Based on the leading Indy R2000 reader chip, the RS2000 integrates all reader-related components into a small surface-mount package that supports four antennas with low system cost. The RS2000's small size and high performance enables OEMs to deliver solutions for a seemingly unlimited number of RAIN RFID use cases including inventory management, asset tracking, industrial automation, access control, process control and consumables authentication. For more information on the Indy RS2000, visit www.impinj.com/products/reader-chips/indy-rs2000. The two new Monza chips, R6-P and S6-C, are drop-in compatible with Monza R6 inlays and retain the industry's longest read range and fastest encoding speed. They include all the ground-breaking features of Monza R6 and add kill and access passwords, range reduction, user memory and usage metering. Applications for R6-P and S6-C include chip-based loss prevention, brand protection, consumer privacy, ticketing and metering. For more information on the new Monza chips, visit www.impinj.com/products/tag-chips. "Impinj continues to drive innovation in item-level intelligence and its new Monza tag chips are no exception," said Torsten Strauch, Senior Vice President of Segment Retail at SMARTRAC. "Our recently announced RFID inlays, Belt and MiniWeb, utilize Monza tag chips and truly enhance merchandise visibility and shopping experience. Now, we can take the next step and expand our portfolio with new inlays based on the new Monza R6-P and S6-C chips. I am sure these inlays will enable new and innovative applications for retailers and beyond." "The expanded Impinj Monza R6 platform of chips combined with our inlays will provide greater flexibility for our customers to enhance brand protection, track and trace, as well as loss prevention throughout their supply chain." said Francisco Melo, Vice President of Global RFID at Avery Dennison. "Impinj continues to deliver the strong performance and advanced features that are needed by global retailers, healthcare providers and manufacturers." "Impinj is an important partner to SML and enables us to provide a comprehensive range of RAIN RFID labels and tags to match any retail apparel application," said Philip Calderbank, Vice President of Global RFID at SML Group Ltd. "Demand for retail solutions is growing quickly and we are able to meet customer needs with the privacy, brand protection and loss prevention features Impinj Monza R6-P provides." Impinj is the world's leading provider of RAIN RFID solutions that deliver Item Intelligence to retail, pharmaceutical, healthcare, food and beverage, and many other industries. We enable the Internet of Things to identify, locate and authenticate billions of items, and our Item Intelligence platform comprises the most comprehensive and widely adopted RAIN RFID product portfolio in the world. For more information about Impinj, visit www.impinj.com. About this company Impinj, Inc. Item Intelligence from Impinj wirelessly captures the identity, location and authenticity of items, enabling, for the first time, trillions of items to be a part of the Internet of Things. Major retailers worldwide are adopting Item Intelligence, enabling efficient omni-channeling, the creation of enhanced shopping experiences, and the collection of valuable data.